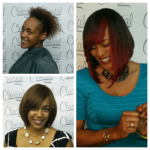 Causes of Hair Loss | Hair Dreams By Christal Inc. Specializes in non-surgical hair replacement systems for those experiencing hair loss due to: Cancer, Alopecia, Telogen Effluvium, Trauma/Surgery, Lupus, Burns, Trichotillomania, Pattern Baldness or Hair loss due to medications. An inherited condition in men, triggered by the hormone Dihydrotestosterone which causes gradual miniaturization (and eventual loss) of hair on the crown of the head.Treated with hair replacement system designed to cover the area of thinning. Attached with tape, medical grade adhesive or clips. The most common cause of hair loss in women. Can occur in early twenties, but usually more common in late thirties and forties. Hair loss is gradual, with miniaturization of the hair follicles. Affects the crown area predominately.Early stages can be camouflaged with hair extensions. Although this does not address the problem area, it provides greater hair volume and requires minimal maintenance.Moderate stages is treated with a hair replacement unit covering the area of thinning, usually attached via clips. Late stages is treated the same as moderate stages, but requires tape or medical grade adhesive for attachment. An autoimmune disease that causes the body to form antibodies against some hair follicles. 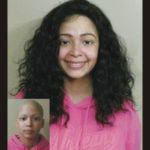 Alopecia Areata causes sudden smooth, circular patches of hair loss.Options depend greatly on how long the condition has been present and what treatments are being undertaken with a physician. 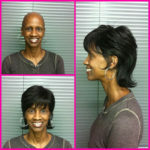 Full head wigs or clip on hair pieces are the best option for most clients. Condition that causes an increased number of hairs to enter the telogen, or resting phase of the hair cycle. It may be triggered by such causes as emotional trauma, major illness, major surgery, or other medically related conditions. 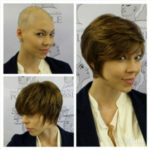 Loss can included some thinning or in some cases complete hair loss. Hair usually grows back after small dormancy period.Since the hair can come out easily and complete re-growth of the hair is expected a temporary solution of a hair replacement system or a full wig can be used. Hair loss due to surgery or trauma. Easily treated with a partial hair replacement system covering only the specific area and attached with tape or medical grade adhesive. Hair is lost through an impulse control disorder characterized by the pulling and removal of ones own hair. 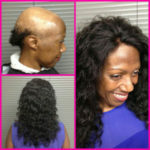 Treatments can include extensions as well as a hair replacement system. 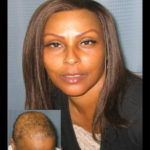 Attachment method depends upon the amount and location of hair loss.